If I weren't for a certain giant green and purple TF I'm waiting to buy, I'd probably have already ordered something here by now. Lets hope there's still a great Huna in stock by then. Ven I bought a mask from you and the paint keeps coming off, what material are you using? How durable is the paint really? how often are you handling this mask? So, if I decide to purchase a Metru red Pakari with a black facial scar, my total (plus shipping) would be around $8? like, poking it, or manhandling it? What mask was it? I use different paints depending on the colors, and I tend to do multiple coats to protect the paint, so it should not be coming off as easily unless you're like, constantly scratching or rubbing the mask against something else. Some masks have been restocked and the list has been updated. Check it out! You got it, $5 for the repaint and $3 for shipping. I will be offering sets of nuva armor for a discounted price. Recolors will cost $10 for the set, and full designs will cost $16.50. I will be updating the first post with this offer. Ven, just wondering, what will you be doing to prevent the paint on the Nuva Armor from scratching off? From experience, the paint doesnt stick to the armor at all, and it comes off really easily. Please stock up on Vultraz's mask and Vastus's helmet. Also, what about the movie edition Krakhaan from Ultimate Dume? 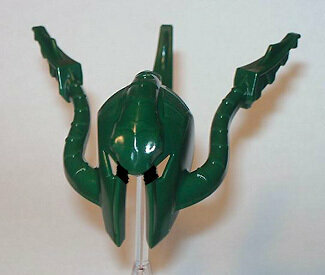 Yeah, especially Vastus's Helmet. That helmet is probably one of my favorite things to modify, just a few cuts and it turns into a really nice looking roman helmet. Also, theres so much room for detail. I actually haven't experienced any scratches or chipping with my paint before, unless it is sprayed on, but even then that only means it either needs more time to cure or it needs an extra coat or two. I've been doing both as precautionary measures regardless, so we'll see what happens. Regardless, I believe you can't expect the paint to stay on permanently, so we have to take care with it as best as you can. I will totally look into getting those, except maybe Dume's Kraahkan. That's a bit hard to snag for a reasonable price. Sounds good, feel free to email me whenever you want to actually make a request. Speaking of which, I want to just go ahead and thank everyone who has made requests thus far for your patience and trust. I'm glad to have fulfilled some of the requests successfully with customer satisfaction. For those of you who have sent your down payments and await finalized orders, bear with me as I have a much busier schedule this week, and it may take a while to finish up your requests. I assure you guys that I am getting your paintjobs done as efficiently as possible. It's all in the first post, bud. It's gotten much better, I'm pretty much back to normal asides from some occasional coughing. Thanks!